Our Merycoidodon skull is a bit distorted by burial, but you can still see some characteristic features. There is a pit in front of the eye orbital. This may have housed a scent gland like that found in deer today. 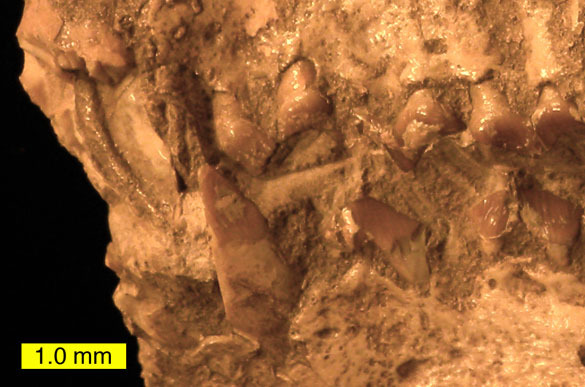 The teeth (close-up shown below) include impressive canines and a row of strong molars for tearing and grinding vegetation. Merycoidodon (the name means “ruminating teeth”) was an artiodactyl (even-toed hoofed mammal) that lived in large herds from the late Eocene to the early Miocene, with peak abundance in the Oligocene. So far they are found only in North America. They looked a bit like large pigs, at least in their bodies, with heads that look rather doggy to me (see below). The adults averaged about a meter and a half long. The herds of these animals would have looked odd to our eyes because they were clearly not built for fast running. Leidy (1848) named these fossils Merycoidodon. However, in 1853 he referred to them by the new name Oreodon. 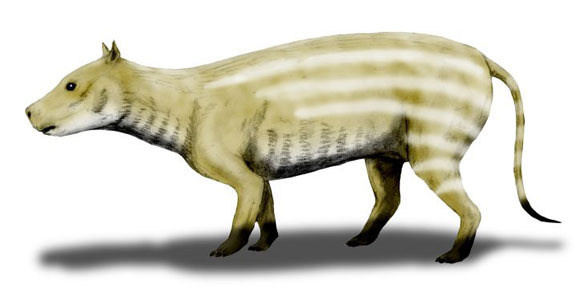 Cope (1884) considered Merycoidodon a nomen nudum (meaning a “naked name”; a taxon inadequately named and thus invalid). Sinclair (1924) wrote that Merycoidodon was a nomen dubium (“a name of unknown or doubtful application”). Lander (1998) called the original name a nomen vanum (“available name consisting of unjustified but intentional emendations of previously published names”). I report this only to show you a bit of the legalism necessarily underlying taxonomy — the science of naming organisms. Taxonomy is a universal language in science and so it must have rigid laws to keep usage uniform. I think it is rather fun to sort out the histories of names and their validity, but most students understandably find it rather dull. 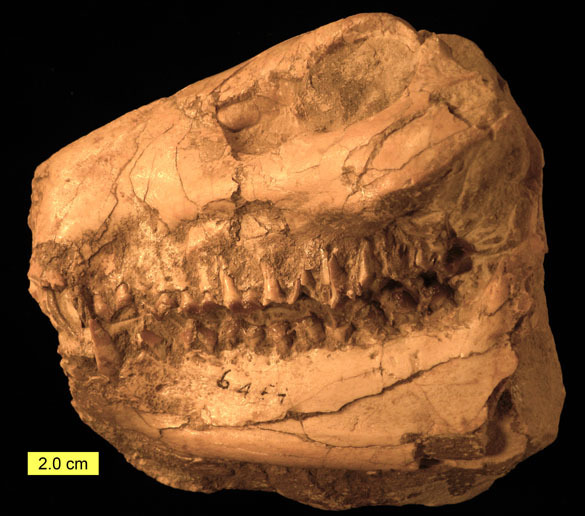 We now refer to this group of oreodonts by Leidy’s original 1848 name of Merycoidodon for two reasons: (1) The Law of Priority: the first name used to describe a taxon is the valid one if done properly; and (2) Oreodon turns out to also be a name in the taxonomic history of a fish genus, and we can’t have confusion like this. Lander, B. 1998. Oreodontoidea, p. 402-425 In: Janis, C.N., Scott, K.M. and Jacobs, L.L. (eds. ), Evolution of Tertiary mammals of North America. Cambridge, Cambridge University Press. Mones, A. 1989. Nomen dubium vs. nomen vanum. Journal of Vertebrate Paleontology 9: 232-234. Stevens, M.S. and Stevens, J.B. 1996. Merycoidodontinae and Miniochoerinae, p. 498-573. In: Prothero, D.R. and Emry, R.J. (eds. ), The terrestrial Eocene-Oligocene transition in North America. Cambridge, Cambridge University Press.